IPVanish is one of the top VPN providers in the market. They have quickly established themselves as one of the best VPN service providers anywhere, providing tier-1 VPN service with fast and stable speeds. The service was launched in March 2012, has aggressively expanded their presence and network coverage, and is continuing to grow by leaps and bounds. The IPVanish team has over 15 years of experience in networking and content delivery services. In this IPVanish review, we look at the VPN features and what sets it apart from other service providers. In Europe: Albania, Austria, Belarus, Belgium, Bulgaria, Croatia, Czech Republic, Denmark, Estonia, Finland, France, Germany, Greece, Hungary, Iceland, Ireland, Italy, Latvia, Lithuania, Luxembourg, Malta, Moldova, Netherlands, Norway, Poland, Portugal, Romania, Russia, Serbia, Slovak Republic, Solvenia, Spain, Sweden, Switzerland, Ukraine, UK. In Asia: Hong Kong, India, Indonesia, Japan, Kazakhstan, Kyrgyzstan, Malaysia, Philippines, Saudi Arabia, Singapore, South Korea, Thailand, Turkey. -Kill switch: Automatically stop (or kill) all network activity if your VPN connection is lost. -Personalization: Allows your IP address to automatically change based on a pre-selected time interval. -Random switching: Customization based on your needs. 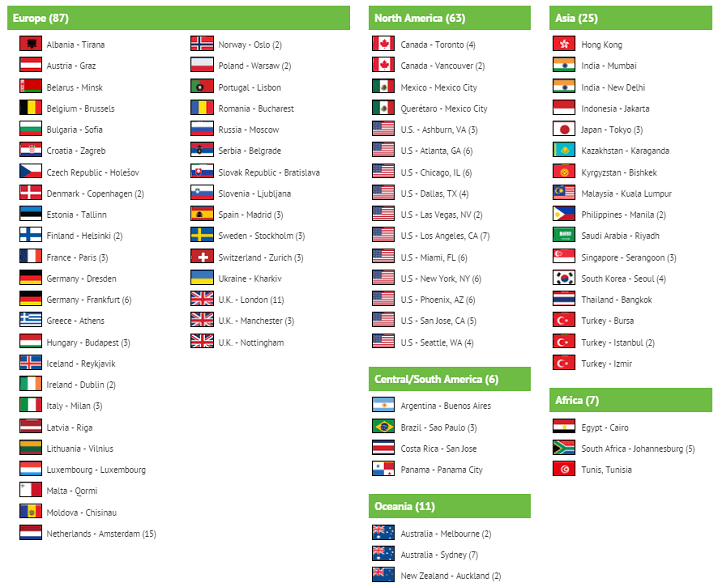 Select server favorites and build a personalized list of locations. IPVanish provides unlimited bandwidth without any usage cap. The upload, download and streaming speeds are at par with the best providers in the business. This makes the service ideal for online gaming, streaming movies and SaaS applications. IPVanish supports major protocols such as OpenVPN, L2TP and PPTP and most browsers like Internet Explorer, Firefox, Google Chrome, Safari and Opera. The VPN client provided by IPVanish is easy to download and set up and supports Windows, Mac and Linux based systems as well as iOS and Android devices. One great thing about IPVanish VPN service is that it allows 2 simultaneous connections, one for an OpenVPN system and another for a L2TP or PPTP device. This makes the service ideal for use from a computer and a smartphone or tablet simultaneously. IPVanish provides excellent support though live chat and email. The live chat system is available during business hours while the email support is available 24X7. Many questions about service updates are also available on their social media pages. Follow IPVanish on Facebook, Twitter, Google+, YouTube, or their blog for the latest information on the service. 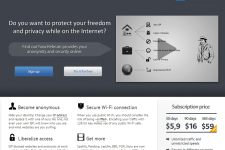 The unlimited VPN package starts from $10 a month. You can save as much as 46% by subscribing to a yearly plan for $77.99 annually, though you will occasionally find coupon codes and special offers for the service, too*. IPVanish offers a 7-day money back guarantee for many users, so you can test its features risk-free. 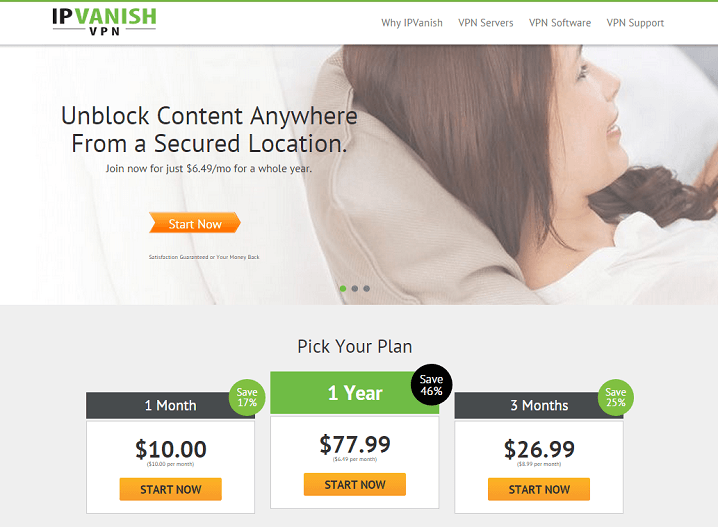 IPVanish offers a premium VPN service at a great price. With unlimited bandwidth, great choice of servers, simultaneous access from two devices, and excellent customer support, IPVanish offers some amazing features that makes it one of the best VPN service providers on the market. To learn more about IPVanish and their offerings, please visit: www.ipvanish.com. This is the best vpn I have found so far that can actually give me the speed that is required to stream the hd content I like to watch online. I like being able to stream whatever I want where ever I want and these guys allow me to do exactly that – it just works and its very fast. I go to China quite often for work and they block darn near everything worth looking at on the web so I gave this app a try and was able to stream netflix and visit twitter, facebook etc without any issue. It is pretty fast too, now I use it when ever and where ever I travel. I never thought I would have to live without Hulu… now I don’t! This is a seriously tough VPN provider who can battle with the best of them! They know how to overcome the battle to break China’s firewall…. they can beat anyone! Recommend this service with 2 thumbs up. I never thought I would have to live without Hulu… now I don’t! 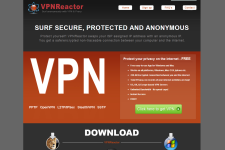 This is a seriously tough VPN provider who can battle with the best of them! They know how to overcome the battle to break China’s firewall…. they can beat anyone! I just renewed my service, and I have to say that the service got a lot better since I joined. I was a little unhappy in the beginning, but now it’s super fast connection and great service (customer and technology). thanks a million! I have never seen a VPN Service PRovider add so many new servers so quickly. IPVanish, you are the best vpn service! Very Very good service. The price is the best part. Got my discounted VPN Service and now I’m watching Homeland and 666 Park Avenue! IPVanish rocks! It was awesome to chat on skype and hang with my cousin over the internet! I am so excited to have ipvanish, and am looking forward to coming home! Not a bad product, but you need to figure out the logistics of what you want to do. I like it, but seems there are other people with different opinions. support was ok, really wish there was a way to make it faster. definitely found this to be worth it with the unlimited bandwidth and free switch. ipvanish really let’s you vanish! some other services may not let you change location, but this one does. I think it’s well worth it with ipvanish. this thing is a great deal especially since it’s offers unlimited bandwidth. I thought that this is ok, but after looking around I think there are definitely better deals for the price. Looking into HMA and supervpn at the moment. tried the 7 day free trial and was hooked. can definitely get things done with the vpn. Definitely suggest this to friends, it’s fast and risk free! fAST AND cheap!!! have been using for almost 6 months and have not had any issues with IPVanish. Definitely a really useful service and the cost is affordable! Free software that’s available and use of all the protocols with IPVanish when you pay for the service. I use this everyday and am not really sure what you would do without it. I like the customer support. It’s all very fast and very reliable with IPVanish. Definitely a good service to use when you are abroad or trying to access certain content like HULU, Netflix, etc. IPvanish is a great service for the price. I can use it to access virtually anything when I’m overseas I use it to access all types of inforatino and sites. I travel a lot, so it’s very important that I can assure myself that files are being transferred and tthe information is not compromised. IPVanish helps relieve me of this problem and I’m sure that it will help you too! Got this creepy message when I was in Asia using a Wi-Fi hot spot. Since then, just never really trusted using my wi-fi in areas like coffee shops, libraries, etc. IPVanish basically does what it says it will. I can now access my mobile phone anytime and not have to worry about who’s looking over my back. Definitely recommend IPVanish to people, really great service for the price.